The PoeTree is going to York University! Hey there folks! Cold enough for you? Well here's some good news to warm your spirit: the PoeTree will make its first stop of the year at York University on January 10th. Part of an exhibit/art battle going on that day, the PoeTree will be set up in the food court and it's all thanks to the generous support and patronage of the York Federation of Students. Check out the map, and if you know anybody on campus, don't forget to let them to know that they can stop by to take and/or leave a poem. 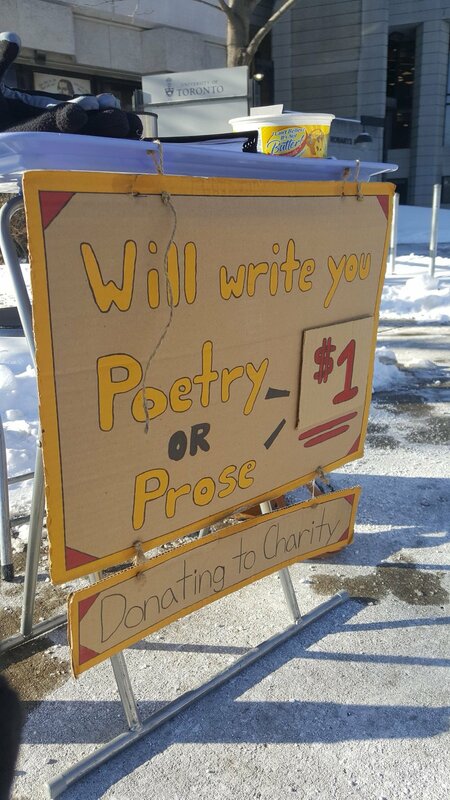 In other news, I recently took the PoeTree back to its Poetry Stand roots as part of my annual crucible of writing in the blistering cold to support the food bank. People were very sweet, and over five days, sitting outside at Robarts in sometimes -20 degree weather, I managed to raise $64.75. This brings the grand total close to $1,500 since I started doing the Poetry Stand back in May of 2015. The full history, of course, can be read right here. I'm looking forward to the new year and hope you are as well.